Day of Giving Countdown - Give $20 and get our new cookbook/recipe organizer! In large bowl, stir together potatoes, oil, salt and garlic powder. 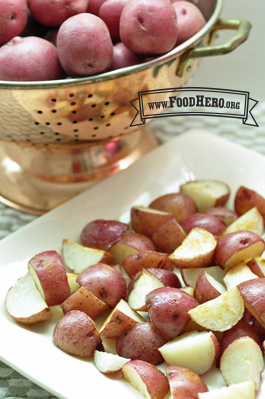 Lay potatoes out on a baking sheet with sides. Bake until potatoes are soft, about 20 minutes. Toss a couple times while roasting. 3 Comments for "Potato Pals"
I have made this recipe many, many times at home and for public events. Based on feedback, I recommend using half the amount of garlic powder called for in the recipe. Thanks for the suggestion. We have updated the recipe to cut the garlic in half! Added fresh rosemary; very good!